Energy and vibration are catalysts each for the other, inseparably intertwined. Each is a necessary ingredient in the elixir of manifestation. 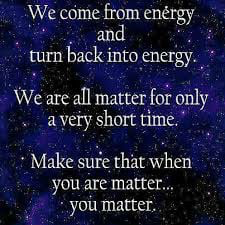 Energy is both the Source and the Force - The Essence - of All That Is. It is both the subject and the object of Creation, a momentum that is Infinite and Eternal, ever expanding and contracting upon itself. Vibration is the alchemy that makes that universal motion possible. Vibration is the the courier that carries Intent, as an arrow shot from the Stillness, that encircles it's target and returns to its Source in a rhythm that has neither beginning nor end. It is the vehicle of Isness in all its possible variations. Emotion is the pathway upon which All That Is travels. It is the gate through which Divine Intent must pass in its yearning to Be One with its Source. It is the resonance that draws the marriage of energy and vibration into the possibility of manifestation. It is the Essence of Isness experiencing itself.